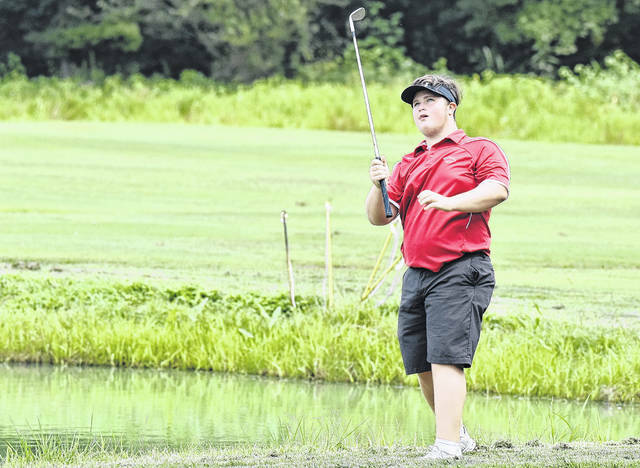 Wahama freshman Ethan Mitchell admires his shot during the White Falcons’ season-opening match on Thursday at Riverside Golf Course in Mason, W.Va.
MASON, W.Va. — Back in the swing of things. In the opening match of the 2018 golf season, Wahama finished 19 strokes off the lead to earn second place in a tri-match with Calhoun County and Sherman on Thursday afternoon at the Riverside Golf Course. Sherman compiled a total of 205 in the count four format to capture victory, while Wahama followed with 224 to earn second. Calhoun County rounded out the field with a total of 227. The White Falcons had seven players compete in the season-opening match, as freshman Ethan Mitchell led the way for the Red and White with a score of 53. Gage Smith, Ty White and Khyer Bush each shot 57 to round out the top-four scorers for the hosts. Also playing for WHS, but not counting toward the team total were Casey Greer who posted a 65, followed by Jilliam Love and Jayvin Roush with matching scores of 70. Sherman was led by match medalist Wyatt Kincaid, who shot a 38. The Tide’s next score was a 51 by Logan Burdette, followed by a 53 by Damon Moore. Joel DeMersman capped off the SHS total with a 63. Calhoun County was led by junior Regan Lynch with a 54. Next for the Red Devils was sophomore Jaden Swearingen with a 57. Bryson Montgomery and Mason Bennett roundedd out the team total for CCHS with matching scores of 58. The White Falcons return to action on Tuesday at Cliffside Golf Course in Gallipolis, Ohio.